The Galápagos Islands were discovered in 1535 by the Bishop of Panama, Fray Tomás de Berlanga. There is a legend that the islands were visited earlier by Inca voyagers, but the evidence for this is tenuous. In about 1570 the islands first appeared on a map. Two maps date from this time, one drawn by Abraham Ortelius and one by Mercator. The islands were called "Insulae de los Galopegos -- Islands of the Tortoises." Following his four years of isolation on Juan Fernandez Island off the Chilean coast, Alexander Selkirk, Robinson Crusoe's prototype, visited the Galápagos Islands around 1709 with the privateer captain Woodes Rogers. The first resident of the Galápagos was an Irishman named Patrick Watkins. It is thought that he was marooned on Floreana in 1807. He spent two years growing vegetables which he exchanged with visiting whalers for rum. In 1809 he stole a whaling ship's long-boat and escaped to Guayaquil. The most famous visitor to the Galápagos was Charles Darwin, aboard the HMS Beagle. Darwin visited only four islands (San Cristóbal, Floreana, Isabela, and Santiago) during his five week stay, but made extensive collections of plants and animals and observations of their natural history. 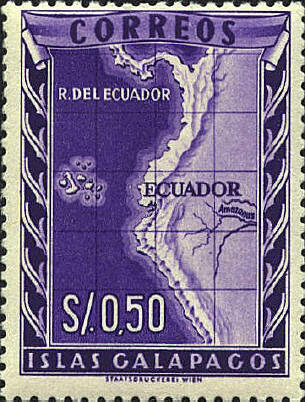 The Galápagos were officially annexed by Ecuador in 1832 and were named "Archipiélago del Ecuador." The stamp was issued in 1957 to celebrate the 125th anniversary of this event.